One of coolest things about digital photography is the instant feedback loop of seeing what the picture looks like. One of the downsides is that your subjects know this, and often want to get the immediate “how did it turn out” feedback. When I was taking the party invitation pictures, Ethan kept tripping over the flash sync cable trying to get a peek at how the pictures looked. My wireless flash setup is arriving any day now, but that still solves only part of the problem. 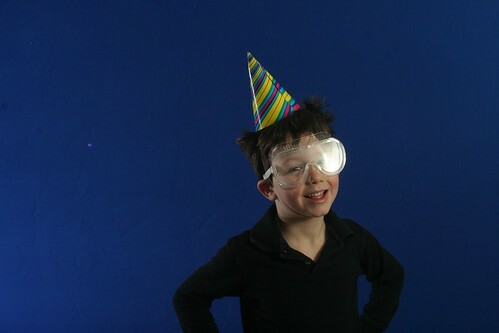 Mostly inspired by John Harrington’s far cooler (and more expensive/elaborate) party photo booth rig, I set up a simple one for my Son’s 6th birthday party. 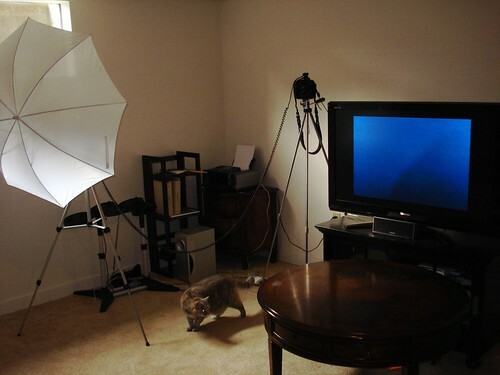 For the setup, I put the camera (Canon Digital Rebel XT) on a tripod with the video out (simple RCA plug) piped into my TV. I set the camera “preview display” mode to “hold” so the camera would send a video signal of the last picture taken until the next one was snapped. The video output is not great (my TV reported the signal as 480i), but it’s enough to give you a sense of the lighting and facial expressions. For lighting, I setup the Vivitar 285HV with shoot-through umbrella camera right as my main lighting. I had a couple of Sunpak DS-20 cheap optical slave flashes floating around the room to give some extra light, which provided some really interesting medium-tone shadows and edge definition. The backdrop is a combination blue/green screen that I got when I was working at PlayStream, making server-side software that would integrate with a video blogging app from SeriousMagic (now Adobe) which did the background subsitution in real-time. Other than making a few “this is Martin Cron, reporting live from the White House…” fake newscasts, I hadn’t used it much. It’s held to a ceiling beam with bungee cords hooked to a pair of 3M command clips, which mount easily and remove cleanly without having to use any tools. This whole thing was triggered from the RC-1 remote control, which I set to a two-second delay which worked out well for a couple of reasons. 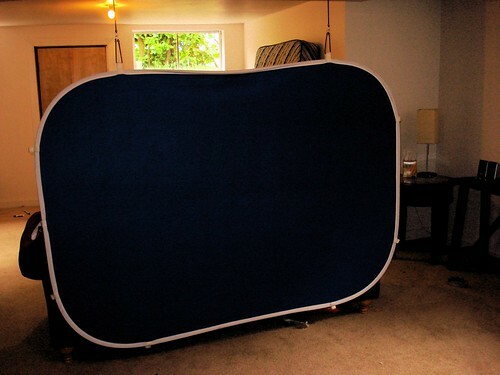 One, the video output would go blank for those two seconds, which would get the kids to stop looking at themselves on the TV and instead look at the lens. Also, the delay insured that the flash (1/4 power) would have enough time to cycle. Most importantly, it gave enough time to get the remote control itself out of frame, as it has to be line-of-sight with the camera. Lastly, I set up a simple “prop table” out of frame for the kids to pose with hats, safety goggles, sunglasses, etc. The cool thing about this setup is that it could be replicated pretty cheaply. The video output cable comes with the camera. The RC-1 is around 30 bucks. While I used diffused off-camera flash, you could do it with available light or (perish the thought) on-camera flash. 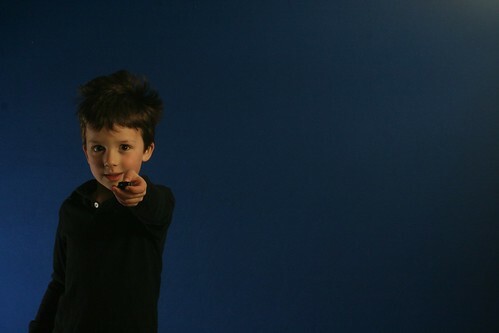 Instead of a fairly exotic backdrop (blue/green screen), you could just line the kids up against a blank wall. The most important thing is, of course, that the kids (all around six years old) had a great time and I got some good pictures out of it. I’ll be able to send back prints of the best pictures with the thank you notes. Great idea. I was looking for an idea for a kids party, and this will be so fun. And probably profitable ! I found this through your comment on the strobist site. Great job! I will definitely use the idea next time I get the chance.